After three and a half years Southern California is still recovering from scars left by the most destructive fire in California History (San Diego County Fire Department.) The Cedar Fire broke out in the afternoon of October 25, 2003 in central San Diego County. As recorded in a 2006 edition of The Weather Almanac, The Cedar Fire spread over 30 miles in less than 17 hours, burning at a rate of 5,000 acres per hour. By the time it died out, the Cedar Fire consumed 280,278 acres (418 sq. miles), 2,820 buildings (2,232 homes) and had killed 14 people including one firefighter. The Cedar fire was not the only blaze burning during this period. It was one of fifteen fires raging across Southern Cal. Nearly every year wildfires break out across the Golden State and like those referenced above, can devastate large areas when fanned by Santa Ana Winds, infamously known for spreading wildfires. 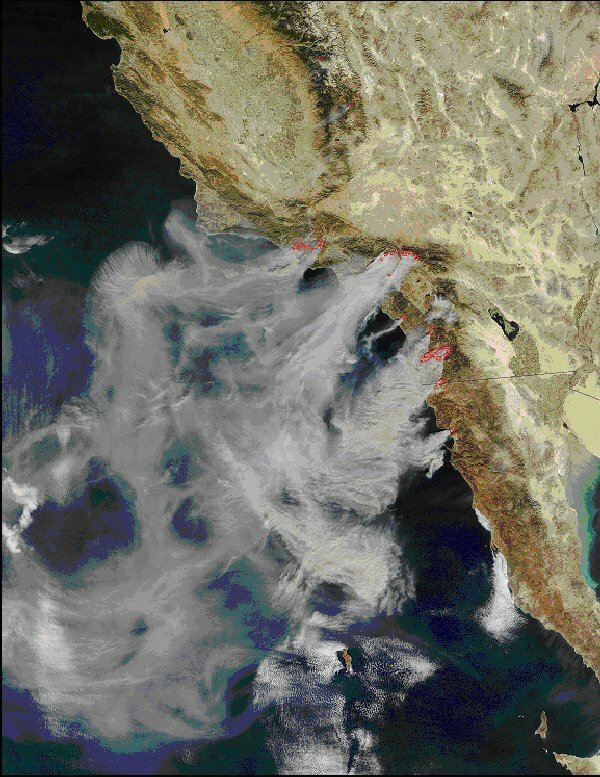 The satellite photo below, courtesy NASA, shows a blanket of Cedar Fire smoke covering San Diego. From north to south, the fifth cluster of red dots is the Cedar Fire. Eight other fires seen in the picture broke out almost simultaneously. After a sunny warm summer when most of the nation is beginning to cool off, Southern California often heats up. It’s a weather phenomena brought on by the “Santa Ana Season,” primarily between October and February. Hot, dry air blowing over already tinder-dry chaparral escalates fire risk levels. For this reason Santa Ana Winds have adopted several names over the years… devil winds, devil's breath, red wind, California’s evil wind, just to name a few. 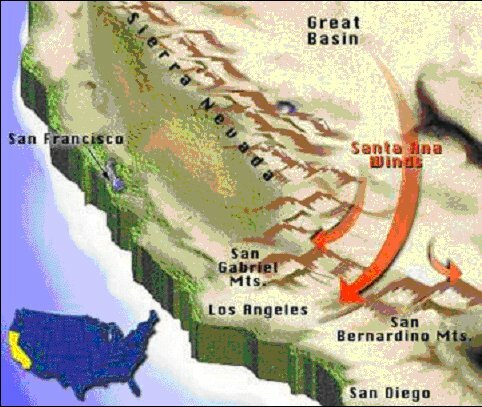 The Santa Ana winds are a relative of the Chinook winds, a.k.a. the Foehn winds. However, unlike the Chinook winds which blow down the Rocky Mountains first as cold air until warmed by compression, the Santa Ana winds are often already warm and definitely dry. They descend from the high desert down the mountains into the Southern California Basin, sometimes at speeds over 100 miles per hour. Most commonly, the Santa Ana winds arise when high pressure builds over Nevada and Utah, east of the Sierra Mountains and west of the Rockies. The pressure gradient between this region and California’s Pacific Ocean produces winds that move out of the high plateau toward lower pressure over the Pacific coast, heating up along the way. As illustrated in the NOAA diagram below, Santa Ana winds typically blow below the passes and canyons of the San Gabriel Mountains. From the mountains base the flow splits, either channeling through the Santa Clara River Valley in Ventura County, or through the San Fernando Valley where it usually splits again. The flow then makes a path either through Ventura County’s Simi Valley, through the passes and canyons of the Santa Monica Mountains and Malibu, or through the Los Angeles Basin. The north-easterly wind heats the air at about 5.4 Fahrenheit degrees per 1000 feet, all the while dropping relative humidity values, often to less than 15%. Meanwhile the mercury is rising. Air temperatures under Santa Ana wind events can heat to over 100 F. Only on occasion, when the air has traveled from polar or sub-polar regions, is the Santa Ana wind cold. The local N.W.S. will usually wait until winds speeds exceed 28 mph, before calling them Santa Ana. Forcing the air through mountain gaps commonly increases the wind speed to 40 mph sustained with gusts of 70 mph, reaching 115 mph at times. With these conditions in place the N.W.S., more often than not will issue a “Red Flag Alert” for high fire danger. In addition to uncomfortable hot, dry, windy conditions and high fire danger, Santa Ana winds produce other hazards. Downed trees, power lines, property damage, even overturned 18-wheelers are not uncommon. The winds are known to enhance turbulence levels and low-level wind shear for aircraft. As the winds move offshore, they can present a hazard to boaters. On the flip side, the higher waves attract So. Cal. Surfers and may be beneficial to local fisheries. When Santa Anas blow off shore Oceanographers believe the sea surface temperature drops by about seven degrees Fahrenheit. Even though the Santa Ana winds are hot, they cause an upwelling of colder water from ocean depths. This water loaded with a higher level of nutrients than the normal surface waters, gives a boost to the biological process. Santa Ana Winds have such a significant impact on Southern Californians, it is crucial, maybe even a matter of life and death, that they be forecasted accurately. In anticipation of the offshore wind event Southern California forecasters must do a good job at handling both the synoptic and mesoscale aspects of the event. As stated in a case study by the National Weather Service, primary considerations include: 1.Whether the offshore surface pressure gradients are strong enough to generate strong offshore winds. 2. Whether the upper air pattern will align with and support the low level winds. 3. Whether the atmosphere’s thermal structure will be favorable for the downward transport of strong winds aloft to the surface. The biggest challenge is not whether the wind will blow but rather, how strong it will blow, where it will blow, and whether a wind advisory or high wind warning is needed. Lack of wind sensors and unique terrain in various locations makes it even tougher to forecast a Santa Ana event at times. There are many variations to the history of the Santa Ana name, however a majority of chronicles place its origin on the Santa Ana Valley/Canyon from which the winds blew on the early settlers of the area. To this day, this theory remains the most acceptable. The Santa Ana Winds lasting impression have earned them recognition time and time again. As reported in the Weather Almanac, mystery writer Raymond Chandler wrote "Red Wind" in 1938. In 1980 The Beach Boys released a song entitled “Santa Ana Winds.” The Doors reference it in their song "LA Woman.” The list goes on to include songs recorded/written by Belinda Carlisle, Poco, Randy Newman, Steely Dan, Elton John, Paul Cotton, Bad Religion, Steve Goodman, and Survivor. It may or may not be surprising to learn there’s a Southern California group who call themselves: The Santa Ana Winds Youth Band.